Here it is! 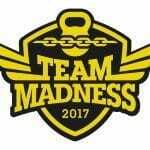 Second year of Team Madness! One day competition full of top athletes from Europe held in the biggest CrossFit gym in middle Europe.